Light Compression Gloves with Grippers warm hands and promote circulation. Breathable, soft fabric includes grippers to help with everyday tasks. Open-end design leaves fingertips free. Latex-free cotton/polyester/spandex blend. These seemed a bit tight at first but after I had them on for a moment they felt so good I rarely don't go without them. I wear these when I use these when I use my computer. They liked these the best! Good gloves. They liked these of the 3 styles I got. got these for my mom and she loves them. people ask where she got them and so we copied the receipt and have been handing them out. I have been having trouble with one of my hands ever since completing a grouting job in Feb 2014. 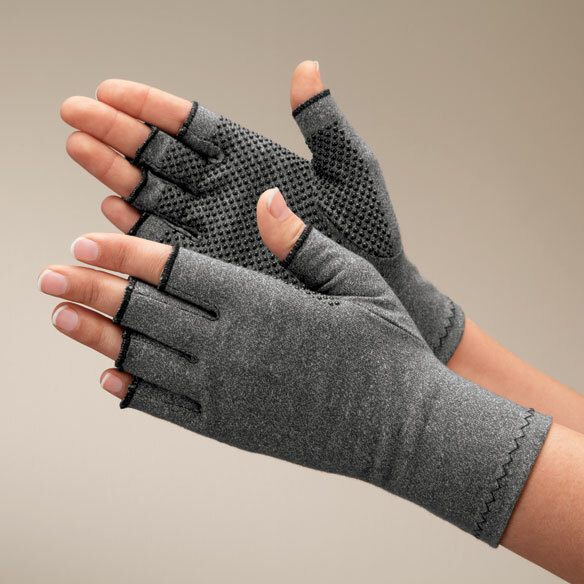 I ordered a pair of these gloves to see if the light compression would help with the pain in the joints of my hand. They work very well; I sleep in 1 and I awaken with no pain in that hand. I don't wear all the time, but I feel that if necessary that would not be a problem. These are compression gloves that I need to wear 24 hours a day. If I don't have them on after doing dishes, for example, and I forget to put them on, my hands start to cramp and hurt. I remember to put them on then and that initial pain lessens quite a bit. I like the grips on them also. I wear them 24 hours a day so they don't last as long as I think they should. Also months after wearing, the black grips will start to come off. to use compression gloves for support afterwards. I love them, especially with the grippers. I have very bad arthritis in my right hand. I didn't think much of anything would help. I was wrong this glove really makes a difference. I always wear while working around the house. It seems to take some of the stress off my hand. It also seems to reduce some of the pain as well. I highly recommend!!!! These are exceptionally comfortable and light weight. They give just enough compression to the hands to relieve stiffness due to stroke or arthritis. I wear mine all the time! I would definitely recommend them! My husband has carpal tunnel in his left hand. These gloves ease his pain. Depending on how he feels, he may wear them at night, during the day, or only a few hours at a time. I had a problem with trigger finger. Injections and buddy taping didn't work. The doctor wanted to do (minor) surgery to cut a leader. My wife suggested this for support of the hand and fingers. It works great. I have a friend in another state with a similar problem that got good results, too. You can feel the difference when lifting heavy objects or even removing jar tops. These were very nice, I have tried a lot of compression gloves, these were the best. Made well. Use these gloves sometimes overnight (when sleeping) or when pain in fingers are unbearable. Very comfortable, has enough compression. Very good quality too - strong stitching and the tops of the finger openings are sewn nicely. Very happy with this product, which arrived in a very timely manner. These gloves do the job. Could be a little longer in the fingers. Overall, nice product. I wear the right-hand glove while playing games on the computer to reduce the pain of arthritis - and I'm finding that it works great. Love the gloves. I had been looking for some compression gloves for a long time. Great fit and price. I have a pair and use them daily. They reduce the pain in my hands, and I like the free fingers. Also, the gloves reduce the amount of germs my hands are exposed to. I already have a pair and they are most helpful with serious hand pain. My younger sister has same problem so I want her to have the relief I have with these gloves, especially while sleeping. These are perfect for my elderly mother. My fourth pair. They simply work great. For my hands, I have pain, so things tend to slip and hopefully these will help do I won't drop things. Need them for my wheelchair. Good for hands and gripping. Because I have carpal tunnel and it might help them outl. I saw it had good reviews. I need to keep my hands warm. Have not tried them but my hands are very sensitive so I thought I would see if they would help. I use these all the time besides the compression I trim the 2 ring fingers so I can wear my jewelry and still have support. Plus when there is a chill in the air they keep my hands warm. I have pain and cramping in my hands and I am hoping that these gloves will ease the pain. These were recommended by a friend. they are very good for my hands .I work soldering and reassures me after work. thank you . Keep right hand warm at night. Same goes for this. And with extra pairs I can wash one and wear another. My sister have arthritic hands, and she says they are a big help and comfort. Used them before. They finally wore out. My left hand has been bothering me and all I can find are my right hand gloves! Godd for work in coolers at grocery stores. I have had prior pair that I loved but I lost one of them. BEST ANSWER: Thank you for your question. We have a womens size and a mens size for the Light Compression Gloves. For the Giant Clock, there is only the one size available. do these come in sizes? BEST ANSWER: Thank you for your question. This item comes in Men's or Women's. We hope this information will be of help to you. who are the gloves made by? You should know. You sell them. They are made in China and sold by Imak Products. I assume one means one pair? BEST ANSWER: Yes, it means one pair. These are wonderful! I find myself wearing them all over the house, except when washing dishes or showering. I even sleep with them on sometimes. Yes one pair of two hands. What is the dimentions across palm for womens sizes /? BEST ANSWER: Thank you for your question. The Womens is up to 3” across the knuckles, measures 7” x 3 ¾” x 1/8”. We hope this information will be of help to you.